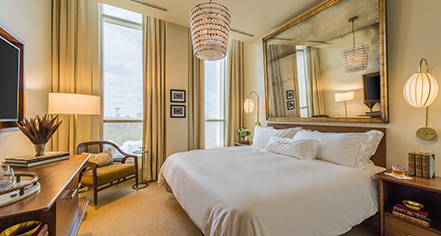 The guestrooms at The Dewberry are a combination of the tried-and-true materials of the South with a nod to its mid-century modern origins. The desks, bars, and custom mahogany wall units evoke a sense of timeless luxury. 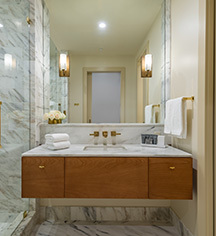 The furniture is principally designed by StudioDews’ John Dewberry and Jaimie Brown, including side chairs, sofas, and tables of travertine and brass situated throughout the guestrooms. Other furnishings include exclusively designed, classic, modern sofas in mohair. The Danby Vermont marble baths feature cypress cabinetry and freestanding deep soaking tubs. Instead of closets, guestrooms have armoires, crafted out of mahogany and linen by Stickley and include hand-illustrated wallpaper by local artist Becca Barnet. The wallpaper pattern is composed of local plants and flowers native to South Carolina, including Black-Eyed Susan (Bloodroot), Cardinal Flowers, Coral Honeysuckles, Creeping Dewberries, Dogwoods, Yellow Jasmine, Milkvine, Spanish Bayonet, Wisteria, and Rattlesnake Weed. Barnet, through collaboration with StudioDew, also created the wallpaper featuring Indigo, Magnolia, Okra, Fig, and Jasmine, in the guestroom floor elevator lobby. The lobbies feature vintage Danish credenzas collected at auction by StudioDew. The chandeliers are a Joseph Hoffman Design from 1914, produced by Woka in Vienna, Austria, and the mid-century lamps were curated by StudioDew.